I am currently sitting in what used to be our oldest daughter's bedroom. She bought her own home, and as soon as she signed the papers, we began to formulate an idea and plan for this space in our house. We both had idea what we wanted the room to look like, feel like and function as. We began the process of agreeing on a paint color, picking out chairs, a table and other items to go in this room, which will function as a study for us. Eventually the room will go from a plan and a collection of ideas to an actuality. The room is being transformed. It hasn't happened overnight, it has been a gradual work and indeed, it isn't finished yet. As Christians, we are also a work in progress. We are being transformed. The Lord is working every aspect of our lives into His plan and purpose to conform us to the image of Christ. There is not one single thing that happens in our lives, which the Lord cannot in some way work to our very best. How powerful He must be! It is His plan and purpose to conform us into the image of His Son, to renew our mind and for us to "prove what is that good, and acceptable, and perfect, will of God." Just as our room is being changed for a specific purpose, the Lord has a specific plan and purpose in His transformation of us. All we need to do is to look around the beauty of the creation in which we live to know that what He will do in and through us will be completely amazing. "And we know that all things work together for good to them that love God, to them who are the called according to His purpose. For whom He did foreknow, He also did predestinate to be conformed to the image of His Son, that He might be the firstborn among many brethren. If God be for us, who can be against us?" 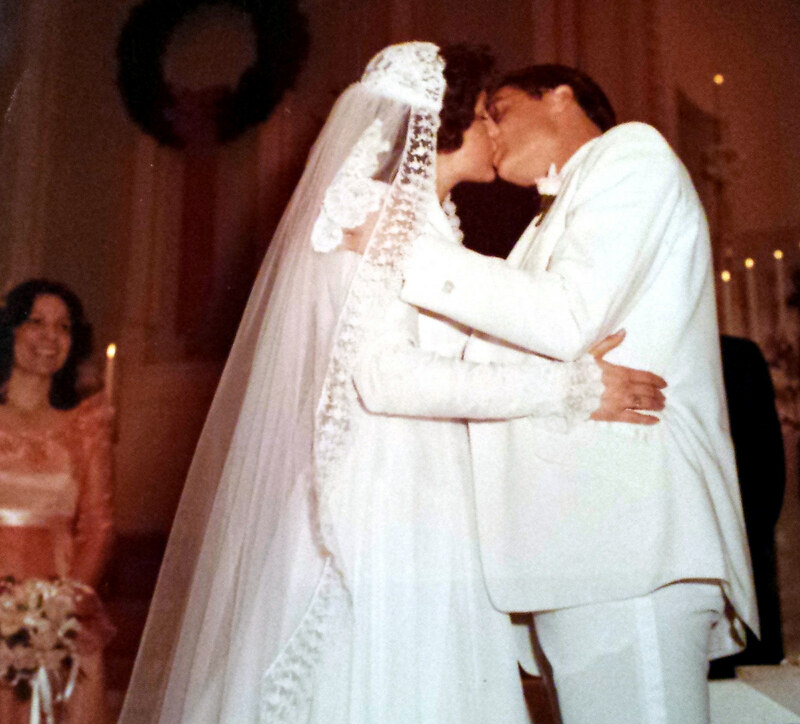 Today is our 37th wedding anniversary. I have lived with my husband longer than I ever lived without him. My life before I met Glen is but a faint memory. In fact, it seems as my life only really started when we met. I could have never imagined as I stood at that altar as a young woman of 21 the wonderful life which awaited me. It has been exceedingly abundantly above all I could ask or think. Another such revelation awaits not only me, but all who have trusted in the Lord Jesus Christ as their Savior. One day we will be physically with Him. Either by death or by rapture, we will be called into His presence. At that time we will fully know joy unspeakable, peace which passes understanding and love unending. Not for one millisecond will we pine for our mortal lives here. The beauty, grace and mercy which we know in His presence will cause this life to seem gray and dim by comparison. This means that no matter how wonderful our days here, our best, most glorious days are yet to be. We should look toward our future with great expectation and hope for we cannot even begin to imagine what awaits us. all that we ask or think, according to the power that worketh in us, be glory in the church by Christ Jesus throughout all ages, world without end. "She can do anything," was a comment made recently about our daughter-in-law. Indeed, she is a unique blend of creative talent, practical experience and intellectual ability. She is clearly one of the most remarkable women I have ever known. In my estimation there is hardly anything she can't do. As much as I admire and respect Jessica's abilities and talents, there is One who truly is omnipotent, He can do anything as along as it is in keeping with His character and nature. Our Lord is the architect of the universe. Architects plan a building in regard to its form, space and ambiance and the world in which we live is perfectly designed in that respect. Think only of the different types of places we have on our one little planet. If you love mountains, we have them. If you like verdant forests, you can visit them. If you prefer the sea shore and crashing waves, there is an abundance of shoreline. If you prefer rivers and creeks, they are here. Our world has been designed with such wonder and beauty it would take more than one lifetime to view it all. And that doesn't begin to include all the other stars, planets and galaxies. But God is also the artist of the universe. He could have easily made our world without color, using only shades of grey, which would have eliminated the necessity of creating the cones in our eyes. Thankfully though, our Lord desired the beauty of our world around us to reveal to us His eternal power and Godhead. He even created beauty in places rarely seen as manifested in the myriad of beautiful and colorful sea creatures at the depths of the oceans. so that they are without excuse:"
A creation needs more than an plan and paint, it needs precise structure. God is the engineer of that structure. His precision and detail are seen in every corner of creation. In watching new construction I am amazed at the details which go into such structures. These plans must include every stud, every nail, every wire, every pipe and things that I don't even know of which go into creating a building. How much more the details involved in millions of stars, solar systems, planets, people, animals. . .just planning the insects alone would be a massive undertaking. Yet our Lord spoke the worlds into being, "And God said. . ."
As our world is made more beautiful by color, it is also enriched by sound and God is the musician of creation. People of every culture seem to love music in one form or other. I have rarely held a baby who could not be soothed with a gentle lullaby. The mathematical structure of music cries out to all that it could not have just magically appeared, no it sings that has a Creator, and our Lord is that Creator. We love music because He loves music. In fact the Scriptures tell us that one day He will "joy over" us with singing. God is also the accountant of His Creation. The Scriptures tell us that the "very hairs of your head are all numbered." How amazing is that fact, that our Lord and Creator loves us enough to count the hairs of our head. Since the number of hairs on our heads are always changing, the Lord must keep an ongoing count. Now, I love my husband, children and grandchildren very much, but I have never wanted to -- much less attempted to-- count the hairs on their heads. Our Lord keeps track of all His creation. The Bible tells us that not one Sparrow falls to the ground without our Heavenly Father. If He is with the Sparrow, how much more is He with us. Let us take time often to consider how Great is our Lord, how worthy He is of our praise and how very much He loves us. During the Christmas season one of our favorite events to attend is the Christmas Concert of Mobile's Singing Children. This choir is made up of children from the second to the twelfth grade and showcases an incredible degree of talent. The Christmas Concert is traditionally held in the Cathedral Basilica of the Immaculate Conception in our downtown area. This Cathedral is one of the most beautiful buildings in Mobile, but of more important on this occasion is its wonderful acoustics. As the older choir begins to sing, usually acapella, the blending of the voices is so beautiful that tears begin to stream down my face. I love listening to their harmonies and angelic melodies and I especially love hearing their voices echo off the walls of the large and beautiful cathedral. This year as the choir began to sing I thought of the day when all we all stand before the throne of God and Christians lift their voices together to praise the Lord Jesus Christ. What a glorious choir that will be and what harmonies will spill forth from those glorified vessels. I thought also of how the sounds of that choir will thrill the heart of God who finds the voices of His children sweet in his ears. Even as this thought was warming my heart and shedding hope to my soul I had another thought. As sweet as the melodies and harmonies lifted from a myriad of glorified voices is to our Lord, there is an even sweeter song to Him. When His children find themselves in painful, perplexing and pitiful situations, the shaky, quiet song of faith they lift up to Him is perhaps the sweetest, most precious sound to His ears. When we are in difficult situations, when we find ourselves in pain or need, and we lift up our hearts to our Lord with thanksgiving and praise, we encourage our fellow Christians around us, we give our own ears fodder for faith and we bless the heart of God. Let us remember the example set for us by Paul and Silas, who after they had been arrested, beaten, scourged, set in stocks and placed in the inner part of the prison, at midnight "prayed and sang praises unto God." Our Lord has promised to give us the songs in the night, let us by faith open our lips to offer Him this sacrifice of praise. In the month prior to our recent hike on the Appalachian Trail, I checked the weather forcast for that area almost daily. Mainly I was looking to see how cold it would be at night and the predictions for rain. As the days passed by, of course, the forecast changed. About a week before we were set to leave the forecast was for clear - and not too cold - conditions. But the forecasters probably didn't expect Hurricane Patricia, then churning around in the Pacific, to make landfall in Mexico and send her remnants barreling through the southeastern United States. The night before our hike was to begin, we again checked the weather. This was a little harder to do in Hot Springs, NC, because there was no telephone reception and Wi-Fi was spotty at best. We could see enough to know, though, that rain was coming and at least part or all of our four day hike would be in the rain. Having had a wet three days on our last hike, we weren't too keen on being soaked again. Our choices were pretty clear. . .don't hike or hike in the rain. 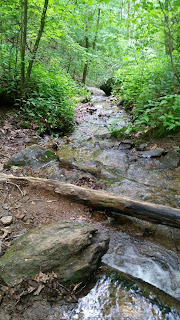 We looked at alternate parts of the trail, to move our hiking location, but at some time all the southeastern portion of the trail would receive rain. That morning we prayed about what to do and as soon as we lifted our heads, another, different thought came to Glen. We were pretty sure we would have one pretty day and perhaps part of the next before the rain would arrive. We decided to hike the trail in the opposite direction, going northward from Hot Springs instead of hiking to Hot Springs. As soon as we finished our breakfast of scrambled eggs and kale (kale is a pretty big thing up in Hot Springs) we met the gentleman whom we had arranged to shuttle us to our trailhead, and told him we wouldn't be needing his services after all. Then we donned our packs and began our hike. The Appalachian Trail near Hot Springs briefly runs along the beautiful French Broad River. We hiked along, listening to the water joyfully dancing on the rocks, and seeing before us the most beautiful canvas of reds, oranges and yellows painted against a bright blue sky. It was so amazing we could hardly take it all in. We hiked until we knew we had reached the half-way point timewise. Then we retraced our steps. We made our camp on the banks of the French Broad River and spent a, not-too-cold, not-too-hot night listening to the river rush by. Once I heard the soft sprinkling of rainfall on our tent, but it was light and short lived. It was probably the most perfect day of Autumn to be hiking. The temperature was perfect, the fall colors abundant and the trail, for the most part, unchallenging. Even though it was much shorter than we had planned, we both agreed it was just about a perfect hike. I was reassurred even more that we had made the right decision when I checked the weather upon returning from the trail. Along with the forecast for rain was a high-wind warning. I don't mind getting a little wet, but I don't want to be camping when all there is between me and high wind is a thin nylon tent. We had made our hiking plans months ago, planning each step of the trip. But the Lord had other ideas. We had to change the date of when we would visit our friends in NC and GA, but both were as accomodating as could be. We even ended up hiking Sawnee Mountain with our friends in Georgia and that day was as beautiful as the day we had hiking in North Carolina. While we made our plans, we didn't lean on our own understanding. With each step of the way, each twist and turn in the road, we acknowledged and trusted our Savior and He did indeed direct our paths. "A man's heart deviseth his way; but the Lord directeth his steps."